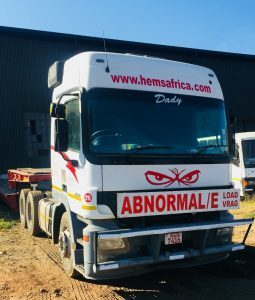 Hems Africa Engineering is proud to announce that they have recruited two new senior recruits, namely, Mr Vincent Padoro, a marketing manager who is responsible for penetrating the market nationally and regionally and Mr Tatenda Marufu, an estimator, responsible for attending to the ever increasing project inquiries from our current and potential clients. Additionally ,we are also glad to inform our existing and potential clients of our new offices recently opened in Harare, the capital city of Zimbabwe. The 55 ton lowbed haulage trailer and 500hp Mercedes Benz truck were recently successfully commissioned. In a short space of time, the lowbed has done two load trips to Unki Mine and Beitbridge Juice Company respectively. More trips are lined up for it in the very near future. With respect to operational matters, we are proud to announce the recent completion of the renovations of the new IDBZ offices as the main steel works contractor. 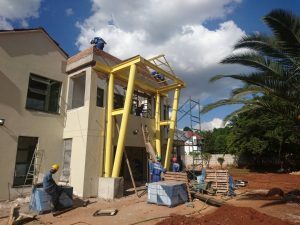 Part of the main structures fabricated was the main entrance verandah steel canopy, supporting column members and the installation thereof. Hems Africa Engineering also fabricated other various components such as sun screen louvers, doors and the main gate. 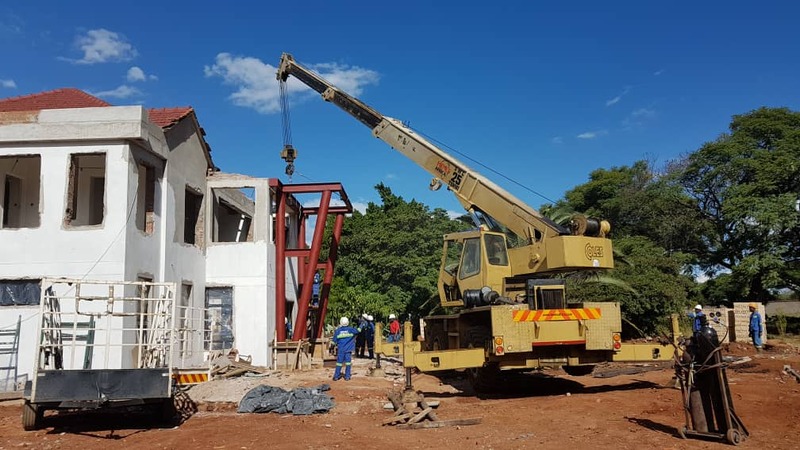 The services of the 25 ton mobile crane were utilized in the installation process to demonstrate our capacity, a feat which very few engineering companies in the country are able to achieve. 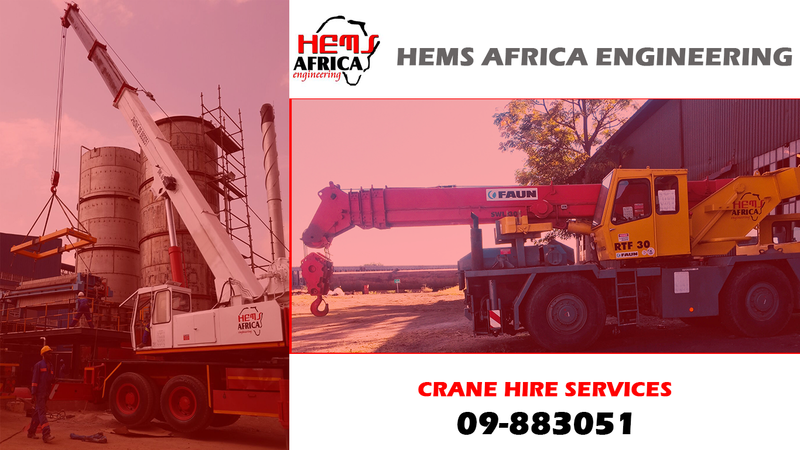 With a crane fleet capacity ranging from 14Ton to 60 Ton, we are just a call away from providing our quality crane hire services from anywhere. 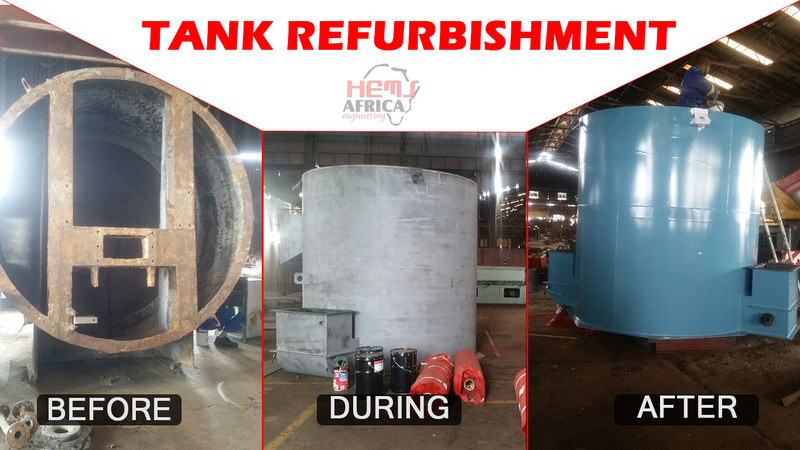 Refurbishment of flotation tanks which included : fabrication of worn out frames ,sandblasting , rubber lining and re-painting.